The XLA9848 and the XLK9848 are the latest version of the popular V2 Terra Ski. The Terra was a favorite of Olympic Champion Kristina Smigun as well as several Russian National Ski Team skies. The XLA9848 series is made with our strong aluminum shafts and forks. The aluminum construction is protected by a clear anodic coating. Then wide 98mm wheel makes them an excellent choice or non-paved surfaces and for chip sealed roads. The wide wheels make the XL9848 the most stable two-wheel classic ski. The XLA9848 is now available in two speeds: medium and slow. The rolling resistance in the 9848 slow free wheels is increased using two of our patented ISR (internal speed reducer), each weighing only 10 grams. The XLA is now available with our Dual Density wheels. The softer inner core aids in shock absorbtion, while the more durable outer core resists wear. Rubber composition: Highly abrasion resistant rubber with a durometer of 82 shore. Available in regular or dual-density wheel for a smoother ride. Wheel Dimensions: 98 X 48mm wide. Wheel Hub: The custom hub is made of aluminum and is designed by Jenex. 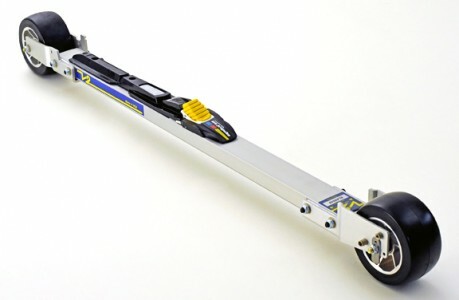 Wheel Forks are designed so that tracking can easily be adjusted.